Last Saturday, Benfica and Braga played one of three crucial matches to decide the next Portuguese champions. Aware that FC Porto had won their match a few minutes earlier, both teams knew a win here was crucial. Therefore, we were presented not with a cagey match, rather with an unbelievably open match that either side could have won. Last night was the ultimate example of what either team did best. 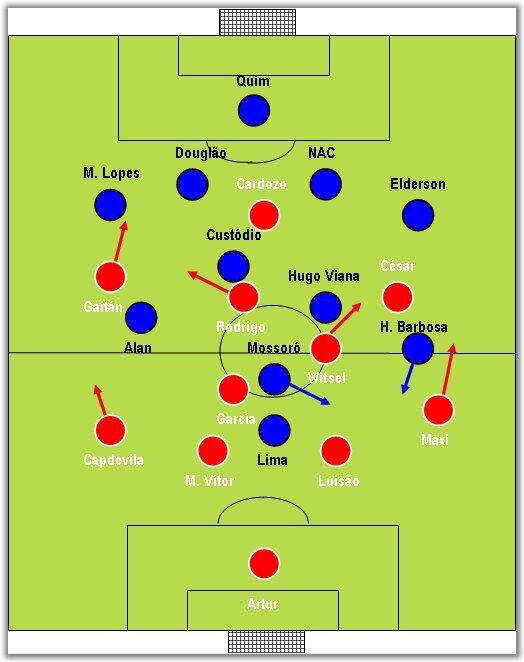 On one hand, Benfica kept their proverbial foot on the throttle (perhaps overcompensating last Tuesday's blander performance against Chelsea) and played relentless attacking football from the get-go. On the other hand, Braga were their usual composed selves and defended bravely and were masters at taking advantage of breakaways. The Eagles tried to smother their opponent right from the start, with Rodrigo taking the place of the suspended Aimar. 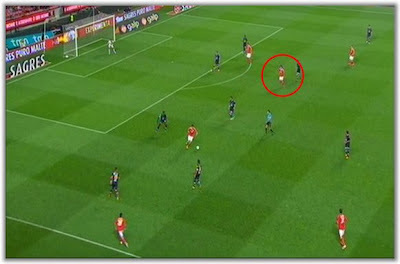 The Spaniard was actually one of the reasons why Benfica had such a good start to the match. Indeed, not only did he drop off Cardozo, but he kept drifting to the left, overloading the wing with Gaitán and Capdevila (who, playing in the position of Emerson, offered different options at left-back). 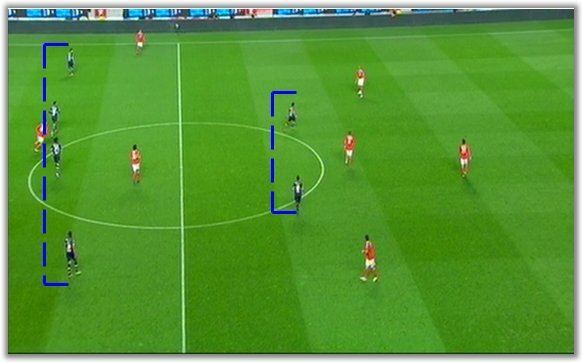 Braga, in turn, clearly knew what they were doing and didn't think twice about counter-attacking mainly through their left side, exploiting the space that both Maxi Pereira and Witsel (playing higher up than usual, in a similar position to the home Zenit match) left behind. Benfica were quite good at getting the ball back high up and managed to do it often, particularly during the first half. 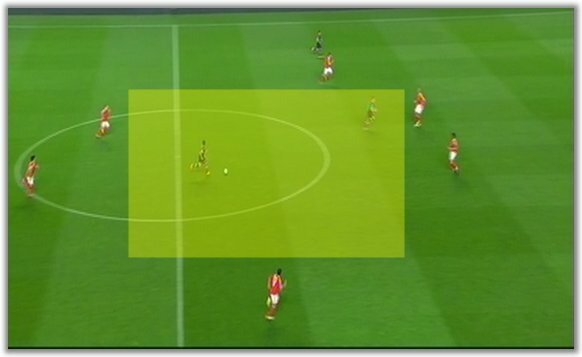 However, when Braga got past the first pressure area and the ball got to Hugo Viana, they were extremely dangerous and often found acres of space and few opponents in front of them. Oddly enough, such an open contest didn't produce many scoring chances during the first half. After getting past Benfica's initial pressure, Braga often found huge pockets of space to exploit. Notice how much space and how many opponents Mossoró has in front of him. The second half was more of the same, only crazier. Neither team could afford to drop points (especially the hosts) and, therefore, it was not surprising to see more scoring chances in the second half's first 10 minutes than in the entire first half. 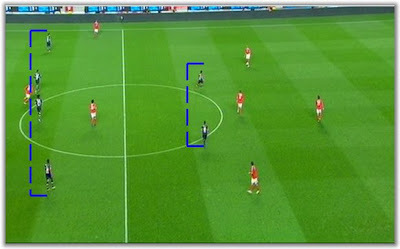 Benfica were even more inclined to attack in numbers, opening up spaces behind them. With Alan less defensively cautious (he was not a winger, rather a right-midfielder for the first 45 minutes), it was very hard to tell who would get the first goal. 60 minutes into the match, Jorge Jesus' men started tiring out, encouraging the away team to try their luck and get something more than just a point from the game, turning it into a free-for-all scoring-chance galore. Ironically, the first goal would come from the penalty spot, after a reckless header from Elderson - hitting Bruno César rather than the ball. Four minutes later, Braga's left-back would redeem himself tapping in a ball that bounced off Artur, after he saved Hugo Viana's free kick. The last goal came in dramatic fashion on the 92nd minute, at a time when Braga were defensively unbalanced after replacing Mossoró, Alan and Hélder Barbosa. In short, it was strange to see such an open match from two teams that have played so well in Europe (Benfica in this year's Champions League quarter-finals and Braga as last year's Europa League runners-up), which is usually an indicator of the ability to control a game. In tactical terms, it was interesting to realise how much last night reflected a whole season for both teams - for better and for worse - and it didn't look like a typical title decider at all. If anything, it resembled the high-scoring matches between the top 5 of the Premier League.